Story helps frame an experience. Basically, I cast the user as the main character. Then plot her journey across the interface. The story’s beginning, middle, and end are implied with clear signposts: simple language and visual emphasis. While story can be the user’s journey, it can also just be a story. Narrative can make a complex topic relatable and understandable, from nanotechnology to cancer research. Pearson Education needed remediation activities in order to be eligible to sell its science program to California. The activities had to reinforce 100s of lessons spanning ages 8-12. I wrote a series of ‘fractured science tales’ to explain challenging concepts. Fun fact: To get these done fast ‘n cheap, we nabbed a narrator from the editorial department. We built an impromptu sound studio in a vacant office. The particles in the first bowl moved slowly. The particles in the second bowl moved fast. The particles in the third bowl moved neither too fast nor too slow. The temperature was just right. A pathogen heads straight for the human girl’s eye! Martha washes it away with tears! 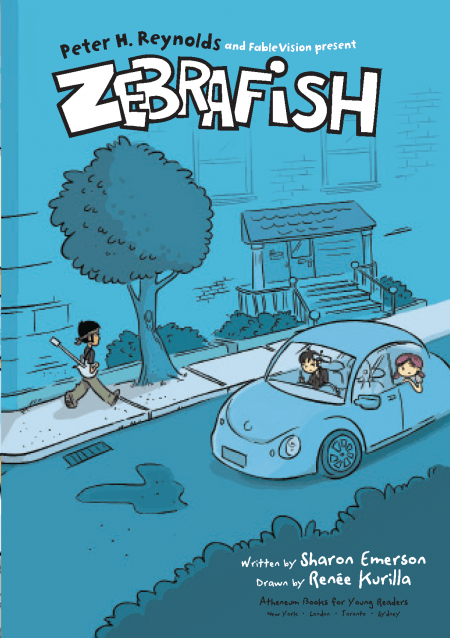 I wrote and directed the animated series Zebrafish for Children’s Hospital Boston. The story models compassion to kids. The goal: make it authentic, so kids feel like they can (and want to) move the meter, however slightly, on something they care about. Later, Simon & Schuster published the graphic novel, making the story available to a wider audience. It received notable recognition: Children’s Choice Book Award Finalist, JLG Selection, NCTE Notable Children’s Book List.